Sand sculptors from throughout the world continue to turn their unique ideas into temporary masterpieces to be washed away with the tide. Only memories and photographs remain of these intricate, but fleeting, art objects. 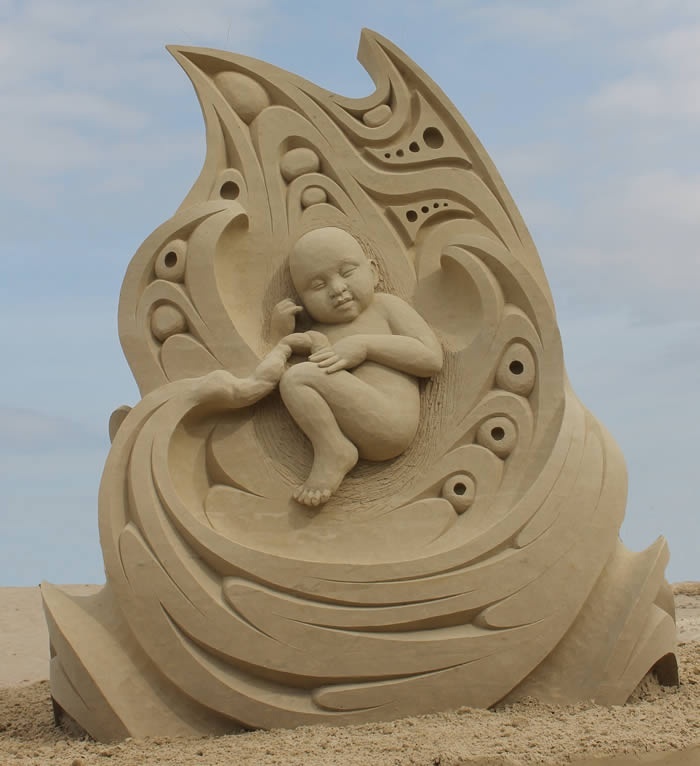 “Life” (side 1) by Karen Fralich took first place at the Hampton Beach Master Sand Sculpting Competiton in June. Perhaps someone can tell me if this unusual art form is on the increase or decline. 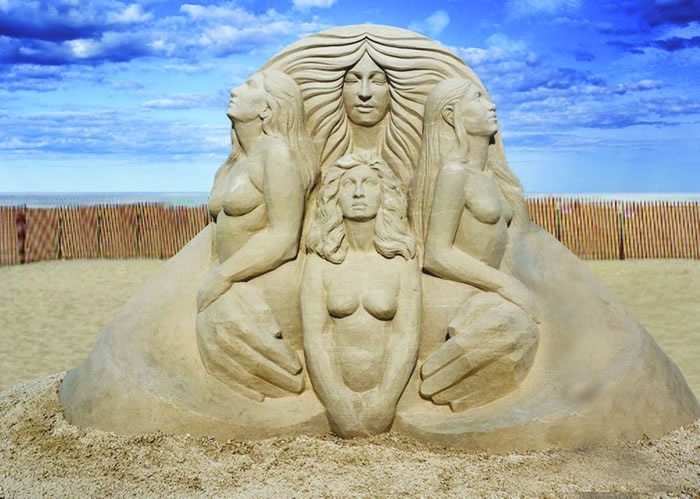 Some sand-sculpture festivals keep going each year; some have disappeared; and new ones have started up since I started featuring this art form in 2009. 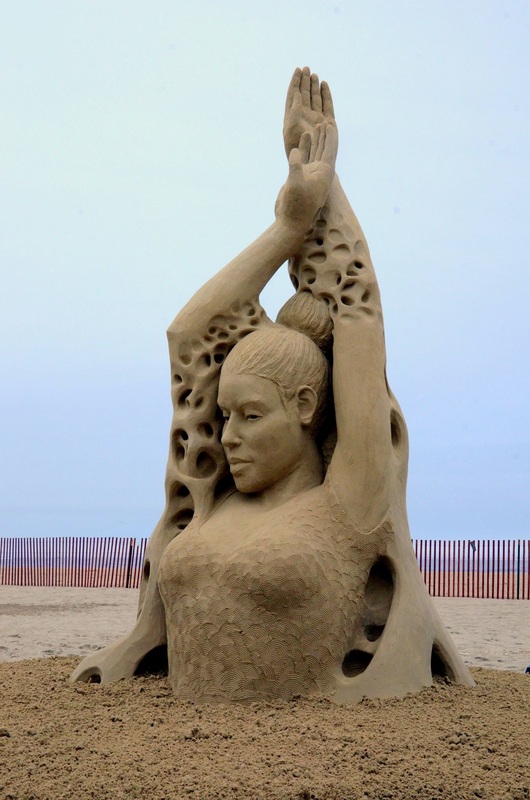 Last year (Water Ways, Aug. 25, 2014), I rounded up all the “Amusing Monday” pieces about sand sculpture. I remain as impressed with the new work today as I have ever been. 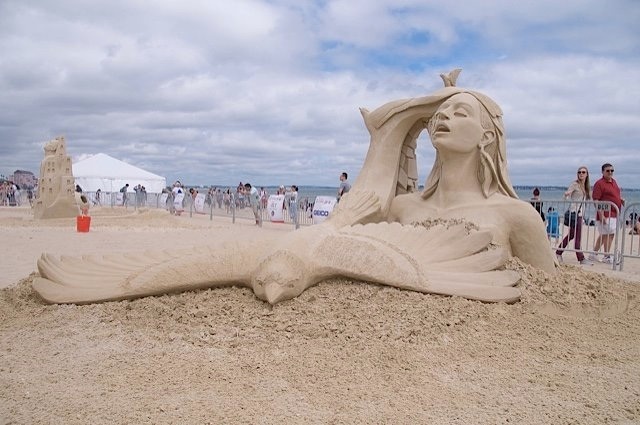 In June, Hampton Beach, N.H., was the site of the 15th annual “Master Sand Sculpting Competition,” which is about as good as it gets. The first two pictures on this page show opposite sides of a sand sculpture created at the festival. The piece, which artist Karen Fralich calls “Life,” took First Place at the festival this year. The best photo gallery of the winning entries was a nice presentation by Boston magazine. The contest features both solo and doubles entries, adding a extra element of excitement. The winner in the solo competition was Mélineige Beauregard of Montreal for “Open Your Mind and Let Your Spirit Fly,” shown in the third photo on this page. 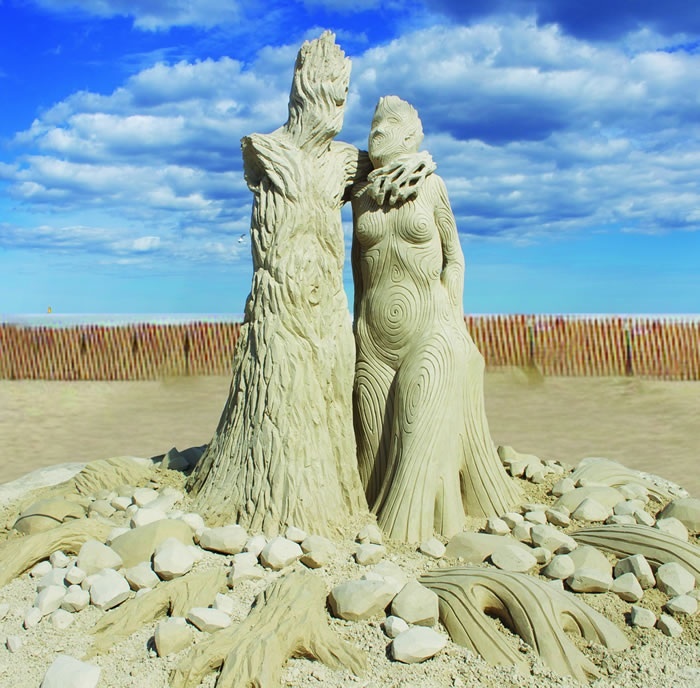 Another good competition is the Texas SandFest held in May in Aransas, Texas. A list of winners with photos is featured on the festival’s website. 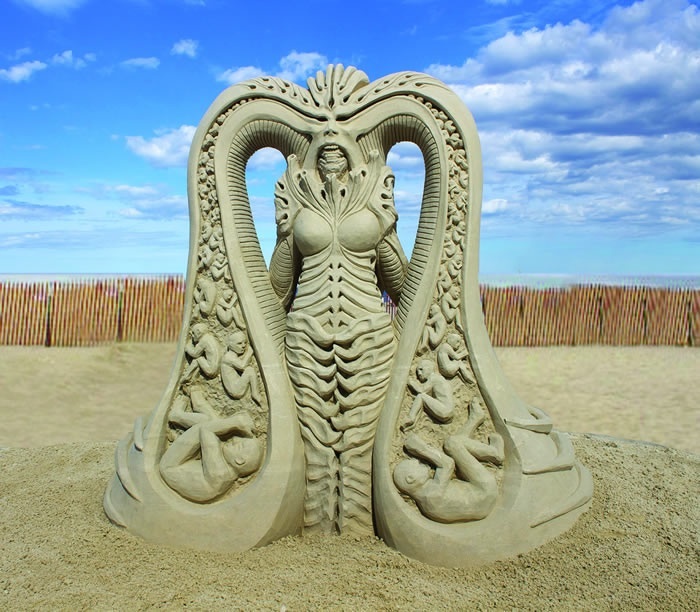 Coney Island held its 25th annual Sand Sculpting Contest this past weekend. So far, few worthwhile photo galleries have been posted, but reporter Kate Cummings of Brooklyn TV News 12 had a report, which I posted in the video player at the bottom of this page. Last year’s event was featured nationally on ABC’s Good Morning America. Finally, coming in our state, Olympia’s annual Sand in the City festival will be held this weekend. Sponsored by the Hands On Children’s Museum, it should have some excellent sand sculptures, though the event is not rated as a top-tier competition. Last year’s sculptures can be seen on the museum’s website. 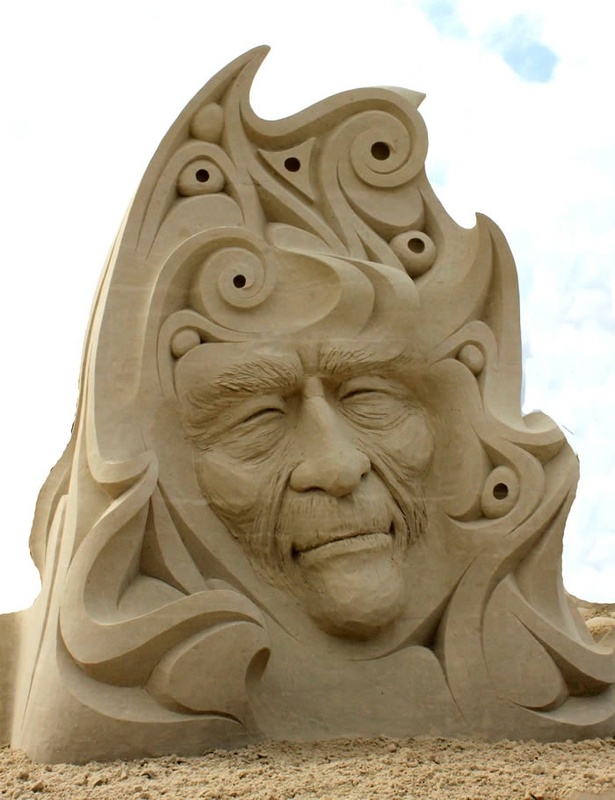 For a fairly complete list of sand sculpting events in the U.S. and Canada, go to SandSculptingEvents.com. Master sand sculptors from throughout the world have been stretching their imaginations this year at various sand-sculpting festivals where they’ve been putting their unique abilities on display. 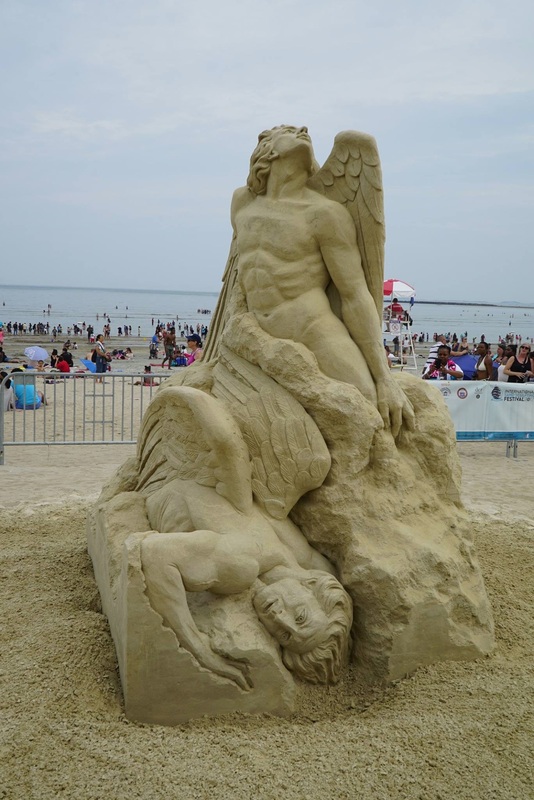 “Inseminate” by Guy-Olivier Deveau of Quebec City, first place in the Master Sand Sculpting Competition in Hampton Beach, N.H. 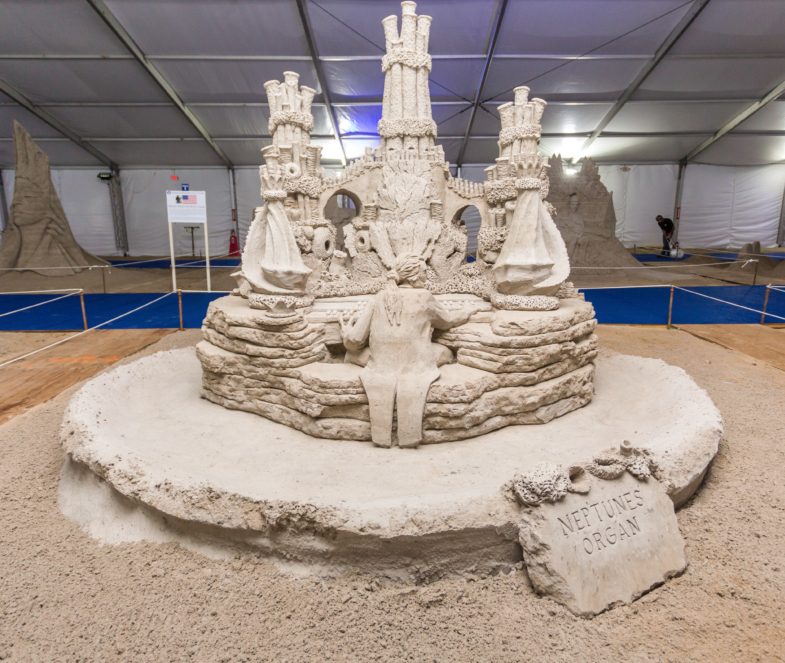 In June, the 14th annual Master Sand Sculpting Competition in Hampton Beach, N.H., brought together a dozen amazing artists, including first-place winner Guy-Olivier Deveau from Quebec City, Canada. Deveau’s sculpture “Inseminate” (shown here) was done as a tribute to the recently deceased Swiss artist H.R. Giger, who helped create the creature in the movie “Alien,” according to festival organizers. I am both amused and inspired by Carl Jara’s piece, “Putting Down Roots,” which depicts a friendly embrace between man and nature (second photo on this page). Jara, of Cleveland, Ohio, continues to impress me with his imaginary figures. Tacoma’s Sue McGrew participated in Hampton Beach, creating a thoughtful piece she called “Mother’s Protection” (third on this page). For a full gallery of photos of the sand sculptures, visit the Hampton Beach visitors page or the Flickr page created for the event. I am sorry to learn that the Arts in Action festival held in Port Angeles for nearly a half-century will come to an end after this year’s event, Sept. 5-7. The folks running the Port Angeles festival were no longer able to continue, and nobody stepped up to take it over, according to Doc Reiss, sand sculpture organizer. “Forty-nine years is a good, long run,” Reiss told reporter Arwyn Rice of the Peninsula Daily News, who tells the history of the sand-sculpture competition and the decision to end it this year. Master-level sand sculpting also has come and gone from Federal Way, which just goes to show that these festivals are as ephemeral as the sand sculptures themselves. “I do feel that art is enriching and that everybody is capable of producing some,” he wrote in an e-mail. “One of the things I like about sand sculpture is how solid and crisp everything looks, when it is really only made from sand. “That makes sculptures like these feel somewhat improbable, making them all the more impressive. I also really enjoy the sheer artistry involved. While it’s easy for me (or any of us) to take a trowel to a pile of sand, it never looks anything like what these folks do. Check out this year’s Atlantic City entries in a slide show created by Jordan Herelle. “My SA” in San Antonio covered the Texas SandFest in Port Aransas. See also Tim Burdick’s photos of the event.